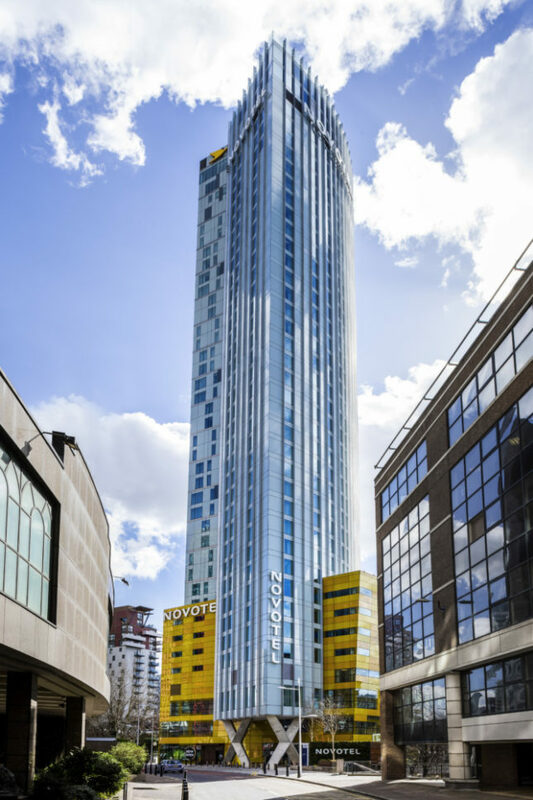 An impressive towering monolith rising up 127 metres above street level and the glittering lights of London’s iconic commercial district, the stylish Novotel London Canary Wharf offers an experience that puts social interaction at its core with 360°degree views across our wonderful vibrant city. 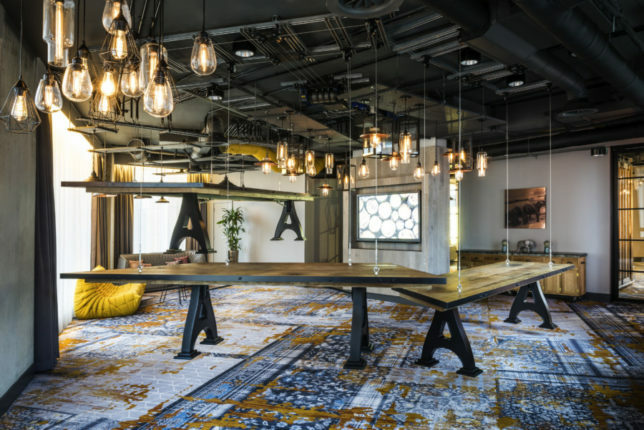 The ideal location for the business traveller working in Canary Wharf or those flying from London City Airport, this 39-storey hotel boasts 313 rooms, 26 individually designed suites, New York-style gym and pool, nine design meeting rooms inspired by the goods brought in to these docks, ground floor coffee shop and contemporary bar and restaurant with rooftop terrace. 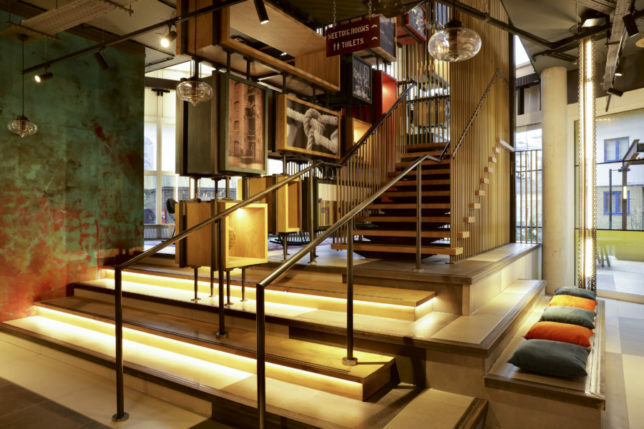 With Architects LRW and interiors agency KONCEPT on board to create the hotel’s industrial design influenced by Canary Wharf’s maritime history, we entered the hotel and were met by an impressive feature staircase suspended by copper vertical rods with heavy solid character oak steps. 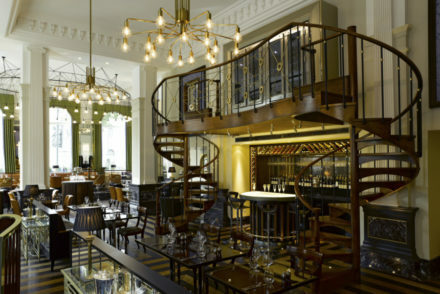 The centrepiece staircase draws your eyes up to the upper levels of the public areas. 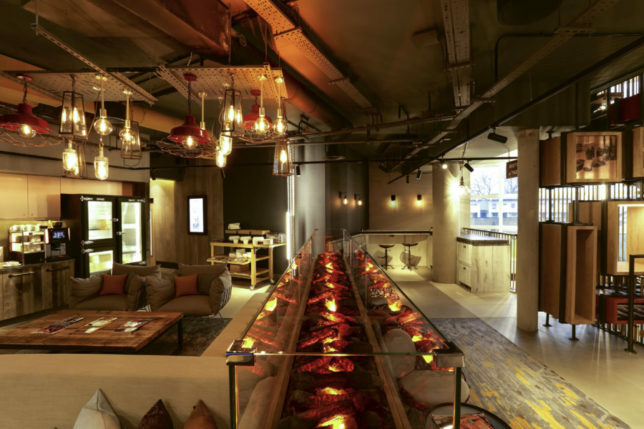 Renowned artist Sam Peacock’s turquoise and red landscape wall with a dusting of Arabica coffee grains, stands alongside darker woods, copper, metals and rope adding vibrancy to the Galleria which was immediately inviting to hotel guests like us. With soft seats, music and in striking distance of Canary Coffee on the ground floor, floor one offers a serene chill out area softened by mustard fabrics, grey relaxing chairs and a central soft seated area which makes you feel right at home after a busy day and ready to unwind. 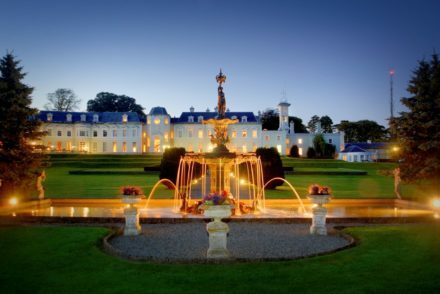 The quick check-in facilitated on tablets impressed us as we were surprised there was no reception desk in sight. Instead we were greeted by one of the Welcomers who made our check-in even smoother. Before we knew it we had our key and were being whisked up to our room. After freshening up and unpacking the Mr Sloan suitcase by ClaireaBella, it was time to get acquainted with the room. 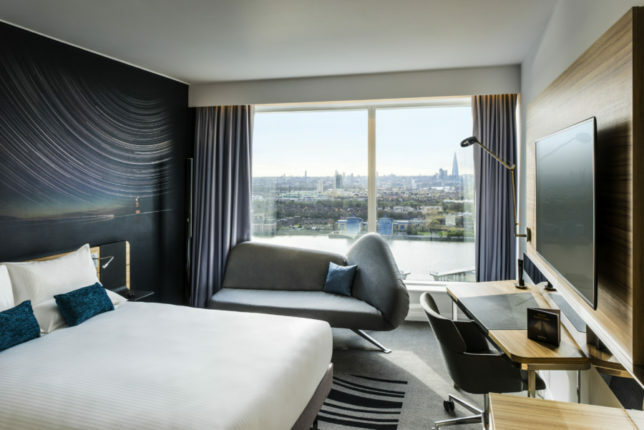 The hotel’s stylish 313 bedrooms are located on floors 4 through 29 with further suites and executive rooms on floors 30 – 35. 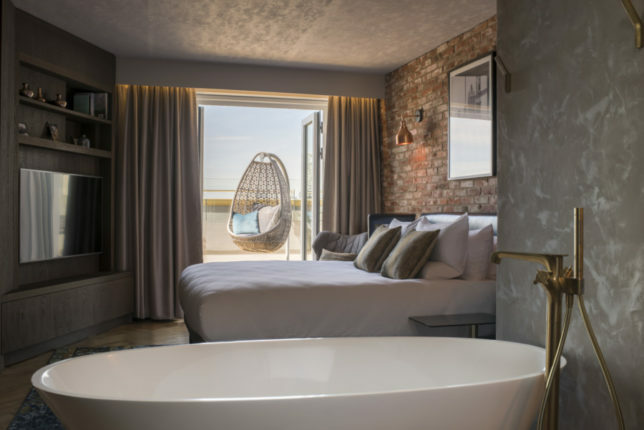 We’re told that every view and every room is unique with decor that focuses on the industrial elements of the design blending natural woods, gold, copper and soft greys that complement the breathtaking panoramic views. 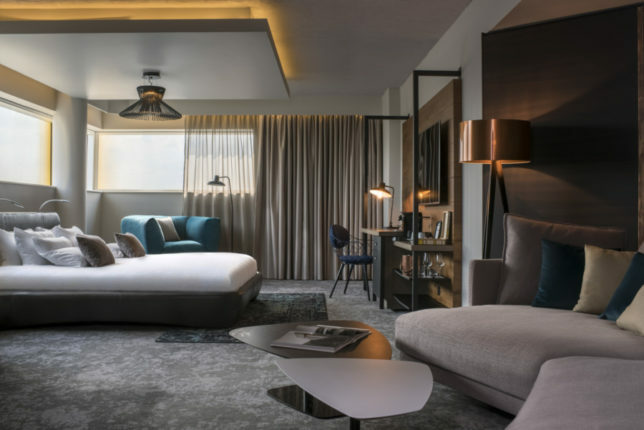 In addition to a large Flat screen TV, work desk, LIVE N DREAM comfort bedding and a sleek bathroom which offers seclusion and relaxation from the bustling city below, the elegant suites have a fully stocked mini bar, turn-down service and private concierge. Soft-sofa seating areas, stocked bookcases and in this case a free standing bathtub and crittal style doors give a feeling of home with supreme comfort and style for ultimate relaxation. Some suites even have a private terrace for entertaining guests or a relaxing space to put your feet up and enjoy a glass of wine. 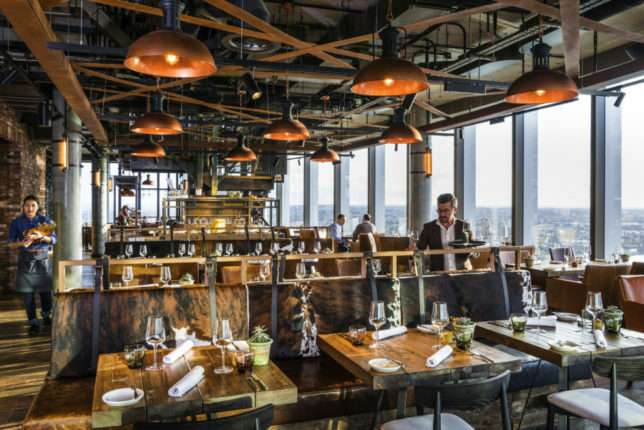 BŌKAN, the hotel’s drinking and dining destination, is split across three levels at the top of the building – BŌKAN 37 Restaurant, BŌKAN 38 Bar and BŌKAN 39 Bar and Roof Terrace. 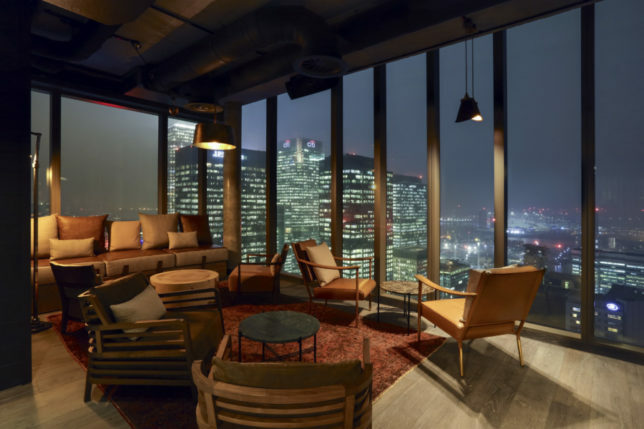 Here both hotel guests and visitors can experience a decadent modern European menu and enjoy experimental cocktails with stunning 360° views across the capital. 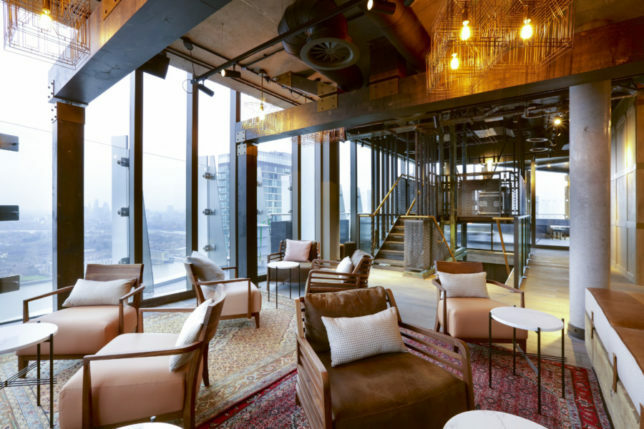 Anglo-Saxon for ‘lighthouse’, BŌKAN, stands as the light at the top of this impressive hotel, encouraging people to interact between floors and the experiences they offer. 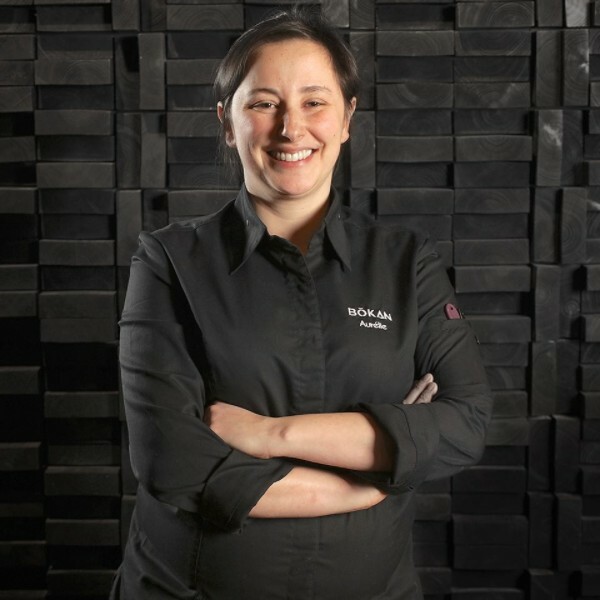 BŌKAN is a destination restaurant in its own right with a seasonal menu curated by Aurelie Altemaire, formerly Head Chef at Michelin-starred L’Atelier de Jöel Robuchon. Starting our evening on at BŌKAN 39 Bar and Roof Terrace, our bartender mixed us a welcoming aperitif cocktail. 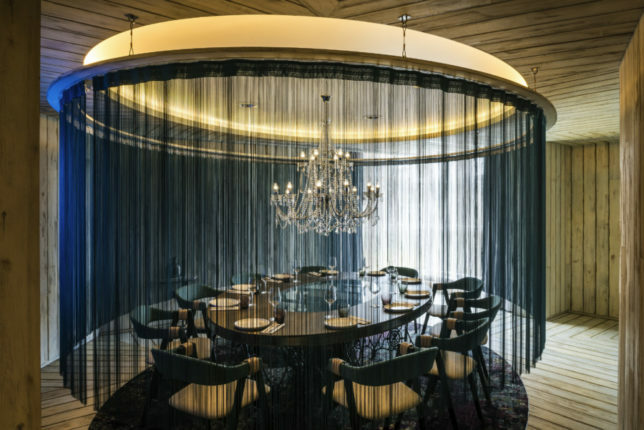 For special occasions we love the look of the private dining room with its glittering chandelier which we couldn’t resist admiring on our way to dinner. 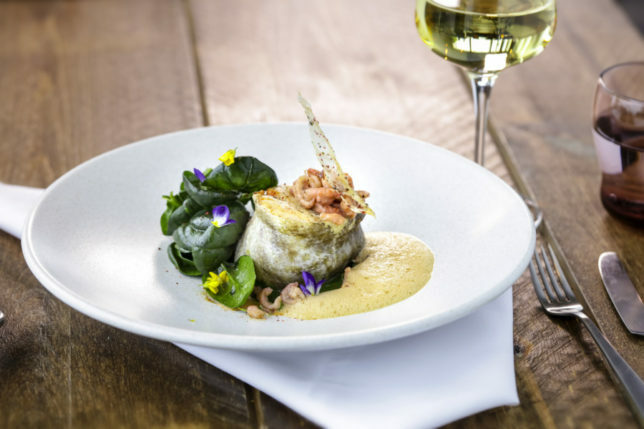 BŌKAN 37 Restaurant’s a la Carte dishes offer a relaxed take on modern European cuisine, using carefully chosen local, ancient and adopted British ingredients that change with the seasons. 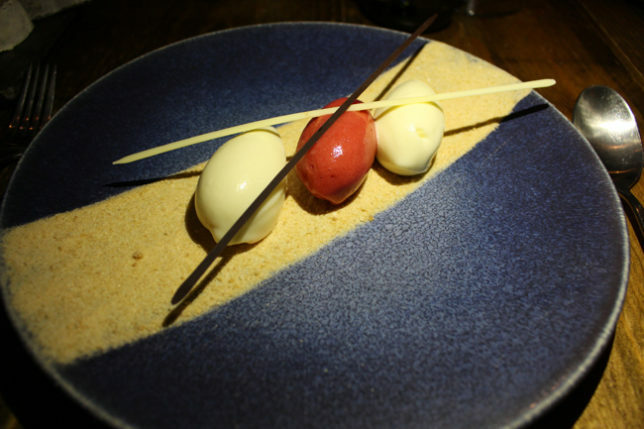 Described as “one of London’s top restaurants” by Thomas Dubaere, Managing Director, AccorHotels UK and Ireland, we were looking forward to sampling Chef Aurelie’s autumn menu. 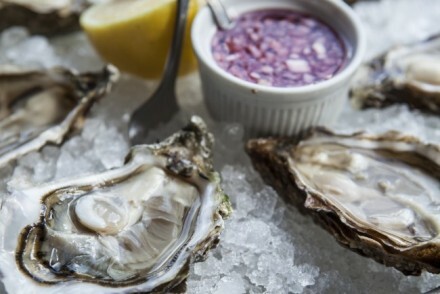 This award winning 2 AA Rosette Modern European restaurant which champions sustainable and organic British ingredients cooked using classic French techniques with a touch of spice to celebrate the flavours that the historic Docklands were famous for. To start I began with the cured & confit salmon with smoked creme fraiche served with potatoes and Avruga caviar. 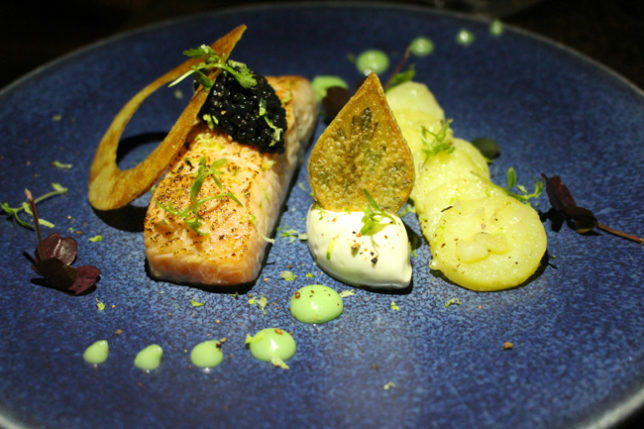 The smoky flavours of the creme fraiche was an innovative pairing with the salmon. 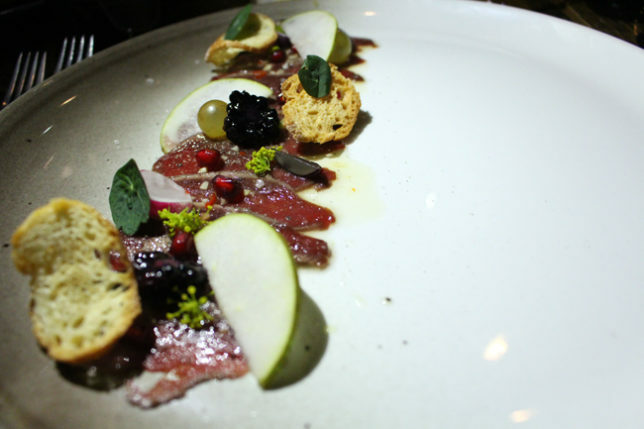 My dining companion chose the Scottish venison carpaccio with chilli & berries dressing pears and fennel pollen. The spicy dressing complemented the gamey flavours of the venison. Moving on to mains, I went for the Rhug Estate salt marsh lamb duo of grilled saddle & confit shoulder prepared with oriental flavours that added depth to the flavour of the excellent lamb. 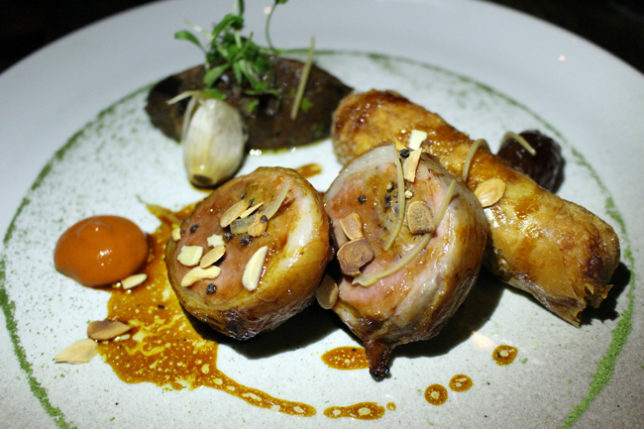 I’ve long been a fan of the quality meat from Rhug Estate so was pleased to see it on Chef Aurélie’s autumnal menu. 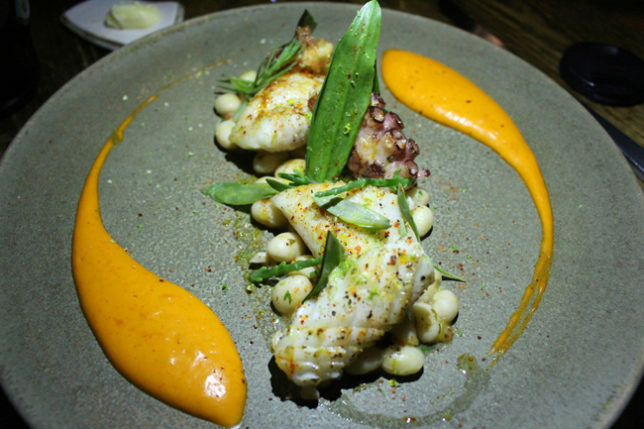 My dining companion had the seared John Dory with Paimpol coco beans, smoked peppers, octopus, squid and yuzu. The coco beans were an inventive addition to this fish dish reminding us of the exotic produce which used to come through the docks in the time before. 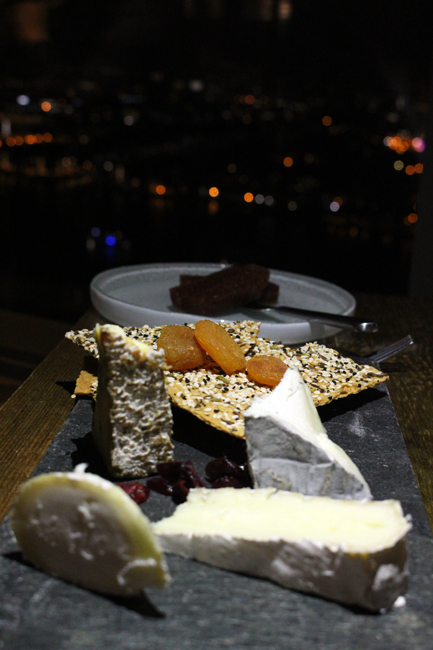 To finish, I couldn’t resist the Cheese Board boasting a fine selection of artisan cheeses. My dining companion decided to try the homemade sorbet for a refreshing end to our delicious meal. 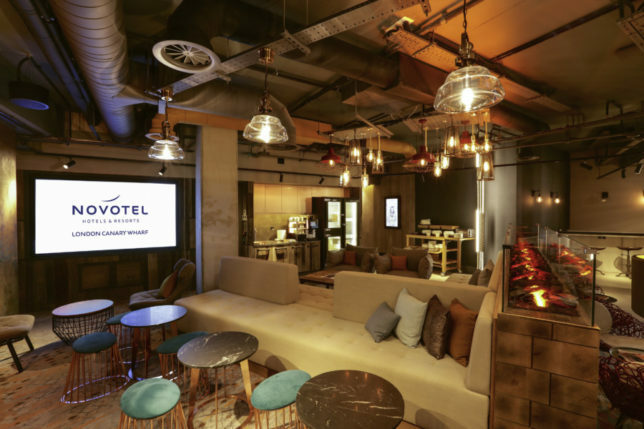 Novotel London Canary Wharf offers its executive and VIP guests style, luxury and comfort with a fabulous dining and drinking destination for both in-house and external guests. 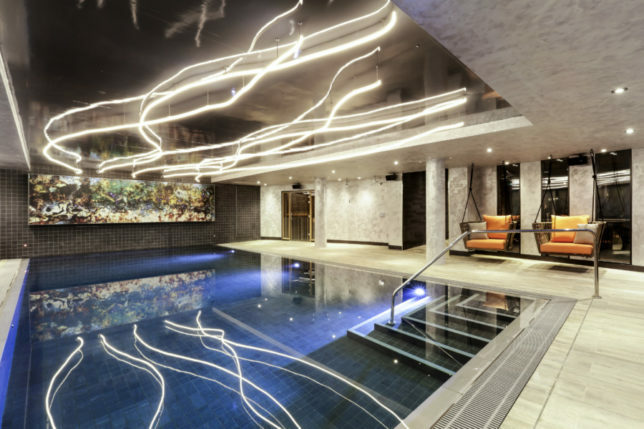 The hotel’s New York style gym and enticing pool are great for those with an active lifestyle or who want to burn off those delicious calories from Aurélie’s a la Carte menu! 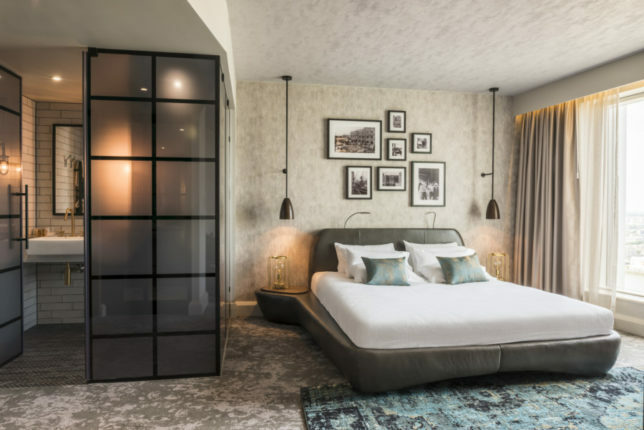 Room rates start from £125 per night (Friday to Sundays) and £235 per night (Monday to Thursdays) with suite rates from £250 per night (Friday to Sundays) and from £340 per night (Monday to Thursday).